*Many of you know that Mr. C and I were pretty far along in the adoption process from Ethiopia when our finances caused us to not be able to continue down that path. I think God was protecting us from the storm that was about to unfurl. Effective March 10th, Ethiopia will be cutting back it's inter-country adoptions by 90% in an effort to contain the corruption the system has been encountering for so long now. I wrote this blog a while back about how this might happen; how we had learned that there were far more people in line to receive a healthy infant from Ethiopia than there were healthy infants actually being "given up" for adoption. I hope this will help spread the word on this program. Ethiopia needs to focus on getting it's system righted and becoming Hague accredited before it opens its doors any further to inter-country adoptions. The following is from Voice of America (VOA) News. Ethiopia is cutting back by as much as 90 percent the number of inter-country adoptions it will allow, as part of an effort to clean up a system rife with fraud and corruption. Adoption agencies and children’s advocates are concerned the cutbacks will leave many Ethiopian orphans without the last-resort option of an adoptive home abroad. Ethiopia’s Ministry of Women’s, Children’s and Youth Affairs has issued a directive saying it will process a maximum of five inter-country adoptions a day, effective March 10. Currently, the ministry is processing up to 50 cases a day, about half of them to the United States. A copy of the directive provided to VOA says the reduction of up to 90 percent in cases will allow closer scrutiny of documents used to verify a child’s orphan status. Ministry spokesman Abiy Ephrem says the action was taken in response to indications of widespread fraud in the adoption process. "What we have seen so far has been some illegal practices. There is an abuse. There are some cases that are illegal. So these directives will pave the way to come up with [safeguards]," said Abiy Ephrem. Investigations have turned up evidence of unscrupulous operators in some cases tricking Ethiopian parents to give up their children, then falsifying documents in order claim a part of the large fees involved in inter country adoptions. American couples often pay more than $20,000 to adopt an Ethiopian child. Such amounts are an enormous temptation in a country where the average family earns a few hundred dollars a month. U.S. State Department statistics show more than 2,500 Ethiopian orphans went to the United States last year. That is more than a ten fold increase over the past few years, making Ethiopia the second most popular destination for Americans seeking to adopt overseas, after China. Child protection professionals generally welcomed efforts to clean up the system. Some, however, questioned the motive behind the cutback. One adoption agency representative who asked not to be identified called the policy "ridiculous", and said it appears to be in retaliation for recent criticism of the government’s lax oversight of the process. 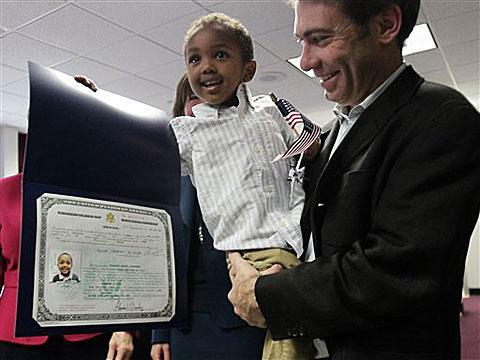 Abigail Rupp, head of the consular section at the U.S. Embassy in Addis Ababa says the cutback is likely to result in a drop in adoptions to the United States from last year’s 2,500 to fewer than 500. She says the biggest concern is for the estimated 1,000 children currently in the adoptions pipeline, who may be forced to wait more than a year for their cases to be considered. "We share the government’s concerns about the vulnerabilities in the process. But certainly we have concerns about children who would be waiting longer for their adoptions to be final. That would mean they would be in an orphanage or transition home for a longer period of time," she said. Rupp said adoption agencies in Ethiopia should take the directive as a cue to be accountable for each case they bring forward, including knowing exactly how children in orphanages came to be there. She said government officials have indicated they may close as many as 45 orphanages as part of the effort to clean up what critics have labeled a “baby business”. Ted Chaiban, head of the Addis Ababa office of the U.N. children’s agency UNICEF, called the new rules “an important step” in rooting out irregularities in the system and finding family-based local solutions for what the government estimates are 5 million Ethiopian orphans. "What is important is that any child deemed to require care be looked at in terms of a range of options starting from family reunification all the way through inter country adoption. In that respect the work being done by the ministry needs to be strengthened and supported," he said. U.S. Embassy officials late Friday indicated they are posting an adoption alert on the State Department’s website addressing the concerns of Americans who will be affected by the Ethiopian government directive. The alert can be seen at www.adoptions.state.gov.